Atherosclerosis is a fully electronic journal, all manuscripts are to be submitted via the internet. To submit your paper online, click on the link http://ees.elsevier.com/ath/. Atherosclerosis has an open access mirror journal, Atherosclerosis: X https://www.journals.elsevier.com/atherosclerosis-x . Basic Research Papers reporting results of original research or investigation using in vitro cell culture or animal models. Clinical and Population Research Papers reporting results of investigation in human subjects including observational, interventional and genetic studies. Meta-analyses and genetic association studies will also be published under this category. For publication of clinical trials, genetic association studies and meta-analyses, please consult the dedicated Special Guidelines below. Translational Research Papers reporting results of research from both bench-to-bedside and bedside-to-bench. The following word limits apply: abstract 250 words, main text 4000 words (including legends to figures and tables), 5 figures and/or tables in total (authors are encouraged to include additional figures and tables as Supplementary Material) and a maximum of 50 references. Flexibility on word count may be offered after discussion with the Editor. Rapid Communications. Authors may choose to submit their Original Research Paper as Rapid Communication. These papers should provide a brief but complete account of important new observations that merit urgent publication. Authors should clearly state in the covering letter why the paper merits urgent publication. The Editor-in-Chief will normally reach a decision on these papers within three weeks. Papers requiring revision will not be considered as Rapid Communications. The following word limits apply: abstract 150 words, main text 3000 words (including legends to figures and tables), 3 figures and/or tables in total, and a maximum of 25 references. Atherosclerosis welcomes submissions of manuscripts previously rejected by high-quality journals because of priority reasons. Please submit your manuscript together with a cover letter, the reviewers’ comments and your rebuttal indicating any revisions made to the manuscript via the journal submission system (http://ees.elsevier.com/ath/) by choosing Rapid Communication as article type. Your manuscript will be assessed by the Editor in Chief and Co-Editors, who will decide within one week whether the paper is accepted or not, with or without any revision. Review Articles. Atherosclerosis publishes review articles on topics of great interest or controversy in basic, translational, clinical or population research. Authors who have not been priorly invited to submit a Review by the Editors of Atherosclerosis are advised to write a letter of interest to the Editorial Office, accompanied by an abstract. Based on this, the Editors will encourage or discourage submission. Please note that we only consider Reviews from authors who contributed significant original research to the reviewed research field. In all cases, Review Articles undergo peer review. The following word limits apply: abstract 250 words, main text 5000 words, 6 figures and/or tables in total, and a maximum of 100 references. Authors are encouraged to include a "mechanism/overview" figure and one or more bullet point boxes highlighting the main key-points. Clinical and Scientific Debates on Atherosclerosis. In this review, two antipodal experts are invited to debate their opposing views on a relevant topic, where every argument is discussed by the author in favour and the author against. Debates articles will consist of an abstract (250 words), a pro section (2500 words) and a con section (2500 words). A total of 6 figures/tables is accepted. References should not exceed a maximum of 100. Conference reports. Conference reports are accepted for publication in our Journal and should be structured as follows: 1) authors and contact details (postal address of all authors and email address of corresponding author); 2) name of the conference and name of the organizing national atherosclerosis society); 3) conference dates and venue, and website address if available; 4) name(s) of conference President(s); 5) topics covered by the conference as bullet points; 6) conference highlights (prosa or bullet points); 7) conflict of interest statement with respect to the congress (e.g. sponsorship). 1 one-column width figure is allowed. The word count of the entire report (items 1 through 6) shall not exceed 450 words. Editorials and Correspondence. Editorials will be commissioned by the Editors, who will approach a suitably qualified author to write a commentary on a recently accepted Original Research Paper of particular interest. Editorials should not exceed 1500 words and 20 references. 1 figure or table is allowed. If you have specific issues that you wish to raise concerning work published in Atherosclerosis, please submit your opinions as a Correspondence. Correspondence articles should not exceed 1000 words (including references), 10 references and 2 figures and/or tables. The inclusion of novel data will increase the chance of acceptance. The Author(s) of the commented manuscript will have the opportunity to respond to the comments in the same issue of the Journal. Please submit Correspondence to the Editor-in-Chief Arnold von Eckardstein. Submission of an article to Atherosclerosis implies that the work described has not been published previously, except in the form of an abstract or as part of a published lecture or academic thesis. Publication of the article is approved by all authors and tacitly or explicitly by the responsible authorities where the work was carried out. If the article is accepted, it will not be published elsewhere by the authors, including electronically in the same form, in English or in any other language, without the written consent of the copyright-holder. Atherosclerosis will not tolerate plagiarism in any form in submitted manuscripts. Passages of text, data or figures quoted or closely paraphrased from other authors (or from any part of the author's own published work) must be identified as quotations or paraphrases and the sources of such material must be acknowledged. The use of unacknowledged material will be construed as plagiarism. If any manuscript is found to contain plagiarised material the review process will be halted immediately, and the University or Institute of the corresponding Author will be informed. Atherosclerosis will not tolerate manipulation or enhancement of data. Authors will be asked to provide further evidence for the validity of data, and the University or Institute of the corresponding Author will be informed if such evidence is not forthcoming. Atherosclerosis will not tolerate plagiarism in any form in submitted manuscripts. Text copied from copyrighted works from third parties or from the author's own published work, in any section of the manuscript, is unacceptable. Each submission to Atherosclerosis undergoes a check for plagiarism. Manuscripts with excessive overlap with previously published articles are rejected without peer review. To avoid the overlap between your manuscript and previously published works, please cite the relevant articles as references. Manuscripts reporting data from research conducted on humans must include a statement of assurance in the Materials and methods section of the manuscript reading that: (1) written informed consent was obtained from each patient included in the study, (2) the study protocol conforms to the ethical guidelines of the 1975 Declaration of Helsinki and (3) the study protocol has been priorly approved by the Institution's ethics committee on research on humans. Identifying information shall not be included in any part of the paper, unless it is essential for scientific purposes and written informed consent for publication in print and electronic version has been obtained. If such consent has not been obtained, personal details of patients included in any part of the paper and in any Supplementary Material must be removed from the submission. If identifying characteristics are altered to protect anonymity, authors should provide assurance that alterations do not distort scientific meaning and editors should note so. For publication of clinical trials, please consult the dedicated Special Guidelines below. All experiments on live vertebrates or higher invertebrates must be performed in accordance with relevant institutional and national guidelines and regulations. A statement identifying the committee approving the experiments and confirming that all experiments conform to the relevant regulatory standards must be included in the Materials and methods section of the submission. We suggest that researchers carrying out experiments with animals refer to the ARRIVE guidelines and recommendations developed by the National Centre for the Replacement, Refinement and Reduction of Animals in Research (NC3Rs) to improve experimental design and reporting of animal research. Authors wishing to publish open access will be presented with the option to publish in Atherosclerosis, or in the journal’s open access mirror journal, Atherosclerosis: X. One, unified editorial team manages the peer-review for both titles using the same submission system. The choice of publishing model will be blinded to referees, ensuring the editorial process is identical. This journal operates a single blind review process. All contributions will be initially assessed by the editor for suitability for the journal. Papers deemed suitable are then typically sent to a minimum of two independent expert reviewers to assess the scientific quality of the paper. The Editor is responsible for the final decision regarding acceptance or rejection of articles. The Editor's decision is final. A structured Abstract must be provided to include the following four sections: Background and aims, Methods, Results; Conclusions (a maximum of 250 words for regular original research papers). A keyword summary must be provided; normally 3-7 items should be included. Abbreviations should be defined when first used in the text. Use of abbreviations should be kept at a minimum. Tables must be submitted as Word files. Tables with titles and legends must be on separate pages with double spacing; they may be included in the same file as the manuscript text or in separate file(s). Authors must list on the title page or in the covering e-mail, the number of figures and/or tables to be found in the paper. Footnotes to tables must be listed with superscript lowercase letters, beginning with "a." Footnotes must not be listed with numbers or symbols. Each figure and table legend should have a brief overarching title (with figure number) that describes the entire figure without citing specific panels, followed by a description of each panel, and all symbols used. If a figure or table contains multiple panels, the letter describing each panel should be capitalized and surrounded by parenthesis: i.e. (A)(B)(C)(D). There are no strict requirements on reference formatting at submission. References can be in any style or format as long as the style is consistent. Where applicable, author(s) name(s), journal title/book title, chapter title/article title, year of publication, volume number/book chapter and the pagination must be present. For authors' name, the general rule is up to 5 names before et al. Use of DOI is highly encouraged. The reference style used by the journal will be applied to the accepted article by Elsevier at the proof stage. Note that missing data will be highlighted at proof stage for the author to correct. Units: Units must be expressed following the international system of units (SI). If other units are mentioned, conversion factors into SI units must be provided. DNA and protein sequences: Gene names should be italicized; protein products of the loci are not italicized. For murine models, the gene and protein names are lowercase except for the first letter(e.g. gene: Abcb4; protein: Abcb4). For humans, the whole gene name is capitalized(e.g. gene: ABCB4; protein ABCB4). Only gene names approved by the HUGO Gene Nomenclature Committee should be used: www.genenames.org. Mouse strains and cell lines: Knock-out or transgenic mouse strains and cell lines are italicized and the symbol superscripted (e.g. ob/ob , p53+/+, p53-/-). All p are italicized and lower case. Language usage and editing service: American or British English should be used, but not a mixture of them. Elsevier accepts electronic supplementary material (e-components) to support and enhance presentation of your scientific research. Supplementary files offer the Author additional possibilities to publish supporting applications, movies, animation sequences, high-resolution images, background datasets, sound clips and more. Supplementary files supplied will be published online alongside the electronic version of your article in Elsevier Web products, including ScienceDirect: http://www.sciencedirect.com. In order to ensure that your submitted material is directly usable, please ensure that data is provided in one of our recommended file formats. Authors should submit the material in electronic format together with the article and supply a concise and descriptive caption for each file. For more detailed instructions please visit our artwork instruction pages at https://www.elsevier.com/artworkinstructions.Footnotes should be used sparingly. Number them consecutively throughout the article. Many word processors can build footnotes into the text, and this feature may be used. Otherwise, please indicate the position of footnotes in the text and list the footnotes themselves separately at the end of the article. Do not include footnotes in the Reference list. Please make sure that artwork files are in an acceptable format (TIFF, EPS or MS Office files) and with the correct resolution. Polaroid colour prints are not suitable. If, together with your accepted article, you submit usable colour figures then Elsevier will ensure, at no additional charge, that these figures will appear in colour on the Web (e.g. ScienceDirect and other sites. For further information on the preparation of electronic artwork, please see https://www.elsevier.com/artworkinstructions. PDF offprints are provided free of charge. No reprints are provided free of charge. Reprints (50 copies minimum) can be ordered at quoted prices on order forms sent out together with the proofs. The International Committee of Medical Journal Editors (ICMJE) defines a clinical trial as any research project prospectively assigning human participants to intervention or comparison groups to study the cause-and-effect relationship between an intervention and a health outcome. Interventions include but are not limited to drugs, surgical procedures, devices, behavioral treatments, process-of-care changes, and the like. All manuscripts reporting clinical trials, must include a copy of the trial protocol including the complete statistical analysis plan, a flow diagram (CONSORT flow diagram), and a completed trial checklist (the CONSORT checklist and template flow diagram can be found at http://www.consort-statement.org/. The trial registration number must be included on the title page of the manuscript reporting a registered clinical trial and in the Materials and methods section. Failure to do so will prevent entry to the peer review process. Registration in a public trials registry is a condition for publication of clinical trials in Atherosclerosis in accordance with International Committee of Medical Journal Editors (ICMJE) recommendations. Trials must be registered at or before the onset of patient enrolment. Purely observational studies (those in which the assignment of the medical intervention is not at the discretion of the investigator) will not require registration. In line with the position of the ICMJE, Atherosclerosis will not consider results posted in the same clinical trials registry in which primary registration resides to be prior publication if the results posted are presented in the form of a brief structured (less than 500 words) abstract or table. However, divulging results in other circumstances (e.g., investors' meetings) is discouraged and may jeopardise consideration of the manuscript. Authors should fully disclose all posting in registries of results of the same or closely related work. Reports of randomised trials must conform to CONSORT 2010 guidelines. All manuscripts reporting randomized clinical trials, must include a copy of the trial protocol including the complete statistical analysis plan, a flow diagram (CONSORT flow diagram), and a completed trial checklist (the CONSORT checklist and template flow diagram can be found at http://www.consort-statement.org). Atherosclerosis is interested in publishing genetic association papers that present data that is novel, statistically robust, clinically relevant and that add significantly to the field. Authors are advised to follow the reporting guidelines outlined in the STREGA Statement (http://www.strega-statement.org) , and to achieve this, the following criteria should be met. f) Possible relatedness between studied subjects must be documented and addressed if present. 2. All papers must include a power calculation to estimate the effect the size the study has the power to detect, based on sample size and minor allele frequency of the included SNPs. If power calculations are not included the paper is likely to be rejected without review. It should be stated whether or not power calculations were performed before or after study completion. Comment: The study should have an adequate sample size. Ideally, power calculations should have been performed before conducting the study since post-hoc power calculations are often a self-fulfilling prophecy. It should be stated whether or not power calculations were performed before or after study completion. Several programs are available to perform power and/or sample size calculations for genetic association studies, e.g. 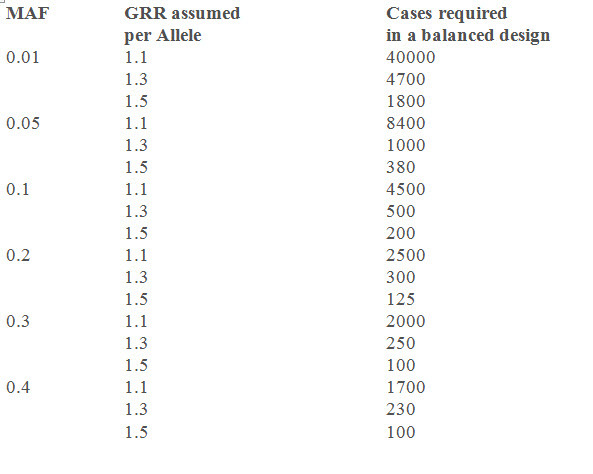 the "Genetic Power Calculator" (http://pngu.mgh.harvard.edu/~purcell/gpc) , and see table 1 below. Sample size and /or Power calculations on two-stage designs can be calculated e.g. by using the program CATS (http://www.sph.umich.edu/csg/abecasis/CaTS)  for case-control studies and QpowR (https://www.msu.edu/~steibelj/JP_files/QpowR.html) for studies on quantitative traits. Since genetic association studies often involve more complex study designs involving meta-analysis or several replication stages, simple answers on required sample sizes cannot be given. Authors are advised, however, to keep this issue in mind and give a good rationale, if the study is clearly underpowered. 3. For any novel association a replication study must be included in the submitted manuscript. Any novel association not including a replication study may be rejected without review. Comment: The presentation of novel association results requires replication in most cases, if appropriate replication studies exist. However, if the first study has already an appropriate sample size (considering that very large studies with several thousands of individuals are available) and if the results show a strong association, it might not be necessary to provide a replication. Furthermore, giving additional evidence from other sources could replace replication studies, if they are convincing, e.g. results from functional experiments. Meta-analysis on the discovery stage or other outstanding studies do also not require replication in every case, but it should be clear that these are exceptional cases and have to discussed in that way to be acceptable for publication. 4. For any association study replicating a previously published finding, there should be sufficient novelty to add significantly to the literature. This could include confirming the effect size in a different ethnic group, or extending the association observations to additional intermediate traits or disease groups. Any study not having sufficient novelty is likely to be rejected without review. 5. We require all SNPs to have their designated RS number and for the numbering of base pair changes and amino acid changes and gene symbols to be using agreed nomenclature. For example see the following website: http://www.hgvs.org/mutnomen. 6. Generally, authors should present the rationale as to why gene regions and SNPs have been selected. Association studies using SNPs where previous studies have demonstrated that the base change has an effect on protein function or gene expression will be favored over those using SNPs where no functionality has been previously determined. Studies using a tagSNP approach will also be considered, where these add additional data to the already known variations, in order to further explain observed associations. Little J et al: Strengthening the Reporting of Genetic Association Studies (STREGA): an extension of the STROBE statement. PLoS Med. 2009 Feb 3;6(2):e22. Purcell S, et al. Genetic Power Calculator: design of linkage and association genetic mapping studies of complex traits. Bioinformatics 2003, 19(1):149-150. Skol AD et al. Joint analysis is more efficient than replication-based analysis for two-stage genome-wide association studies. Nat Genet (2006) 38:209-13. In the following table, some sample sizes are given, calculated from the "Genetic Power Calculator", assuming an alpha-level of = 0.05, an additive inheritance model, an assumed prevalence of disease of 30% and a power of 80% for a balanced case-control study (1:1 case:control ratio) for varying minor allele frequencies (MAF) and genetic relative risks (GRR). Relative risks of between 1.1 and 1.3 are in the range that can be expected in genetic association studies on complex diseases. In principle, literature-based meta-analyses should be reported in that way, that any interested researcher is able to reproduce the results. To ensure this, authors are strongly advised to follow the guidelines listed below and are further encouraged to use the PRISMA (http://www.prisma-statement.org/PRISMAStatement/Default.aspx) and the MOOSE statements (http://jama.ama-assn.org/cgi/content/full/283/15/2008) as a guide. Therefore, as much information as needed should be provided. However, for the average reader only the most mandatory information should be reported in the main paper with additional information given in the Supplementary Material. 1. Specification of objective and primary study outcome. If there are previous meta-analyses on the same outcome available, the authors should specify clearly the differences and added value of their meta-analysis in a separate section ("Added value to previous meta-analysis on the same topic"). 2. Detailed specification of search strategy, study selection strategy (including approaches to reach unpublished studies) and eligibility criteria for studies. It is highly recommended to use a graphical Flow Chart (templates available at http://www.prisma-statement.org/PRISMAStatement/Default.aspx). Methods used for the combined analysis (fixed effects, random effects) including a rationale for using this method. Individual study results (effect estimates including confidence intervals or standard errors). Graphical presentations is preferred (Forest plots). Genotype characteristics (genotyping success rate, minor allele frequency, frequencies of genotypes, Hardy-Weinberg-equilibrium).